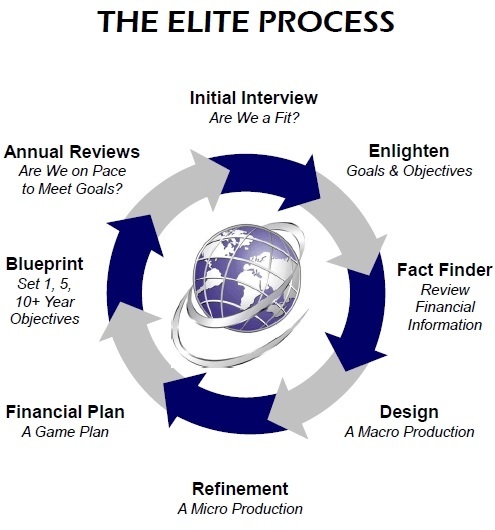 At The Elite Financial Network, Inc., we genuinely care about our clients and their financial success. To set them on the right path, instill confidence, and help them make informed financial decisions, we guide them through a holistic planning process. Before we begin working with a client, we conduct an initial interview. This gives both parties the opportunity to learn more about each other and determine if we are a good fit. As we like to build close, long-term relationships with clients, we take the time to spend the first few meetings talking, learning about their financial circumstances, goals, needs, fears, and gaps. This extensive data gathering and fact finding allows us to evaluate a client’s entire financial picture, identifying immediate needs and long-term goals. We rely on this information to create customized strategies tailored to their individual objectives. By explaining the reasoning behind our recommendations and educating clients on their opportunities, we seek to empower them to take an active role in their financial life. Based on their feedback, we refine their strategies and implement their personal financial plan. Once their plan is implemented, we continue to connect with them throughout the year. We help them set their immediate and long-term objectives - one, five, and ten years down the road - and conduct annual reviews. Beyond these formal meetings, we communicate with clients on a regular basis, whether we’re hosting an event, answering a question, or sending an email simply to check in and say hello.